Four membrane types: polyethersulfone (PES), cellulose acetate (CA), cellulose nitrate (CN), and nylon (NY). PES filters have lowest protein binding and fastest flow rates. 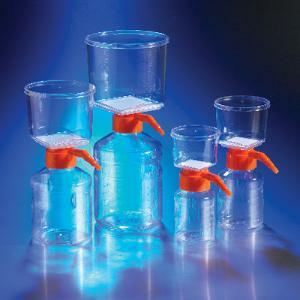 Filter funnel, dust cover, and receiver/storage bottles are polystyrene. Tubing adapter, filter adapter ring, and plug seal cap are polyethylene. Pore size, part number, and membrane type are printed on each unit. Gamma radiation sterilized. Certified nonpyrogenic. Units feature stable profile receiver bottle with easy-grip sides and angled hose adapter to minimize tipping. The new square membrane funnel design provides improved flow rates. Receiver converts to a storage bottle by removing filter and applying sterile plug seal cap. Ordering information: Systems are comprised of filter funnel, filter membrane, filter cap, neck adapter, receiver, receiver cap, and hose connector.